Synaptogenesis…ever heard of it? I hadn’t either until recently. While listening to a podcast on my MP3 player while out walking Vivvy, I discovered that synaptogenesis is the formation of new synapses in the brain. These are connecting points that link brain cells, approximately 100 billion of them, and it’s how our brain cells communicate with each other. Well, it got me thinking about other areas of my life, especially writing. I’ve always been a writer who needs a solid block of time during which I know I won’t be disturbed in order to write anything like meaningful prose (!). But in the spirit of trying something new, I decided to give writing sprints and timed writing a go. Many writers have success with this kind of writing, but I never thought it would work for me. Since I wanted to do it properly, I downloaded the Pomodoro app to my phone I set it for twenty-five minutes of writing, followed by a five-minute break time during which you get up and move away from the screen and do something unrelated to writing. Well, it’s been a revelation! Not only does it seem to work for me, but my word count has soared. Okay, I know this is great for a first draft, and there’ll be some things to fix in the second draft, but hey, words on the screen are always welcome, thank you very much! As they say, you can’t fix a blank page. So, I’m going to continue with this new way of writing and along the way fire up some new connections in my brain 🙂 It’s a win/win! I hope my American bloggers enjoyed a Happy Thanksgiving Celebration yesterday with family and friends. Thanks to everyone for your supportive messages last month. Peter is visiting the hospital for various tests and this week we are meeting with the Consultant to discuss results. We hope for a diagnosis, treatment plan and information as although Peter is brave and stoic it will help to know what we are dealing with – fingers crossed. 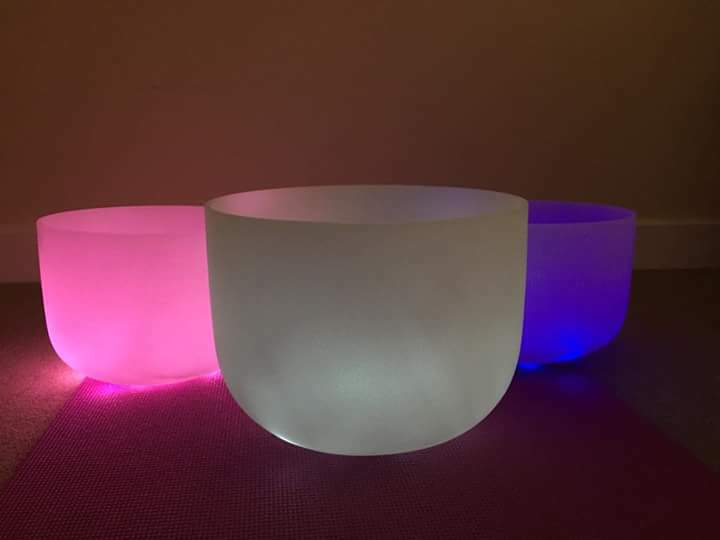 This month has been reflective in many ways but I have had some old experiences which are helping me deal with my stress levels and new experiences which have been very thought provoking, I will tell you one old experience which we have repeated over many years. 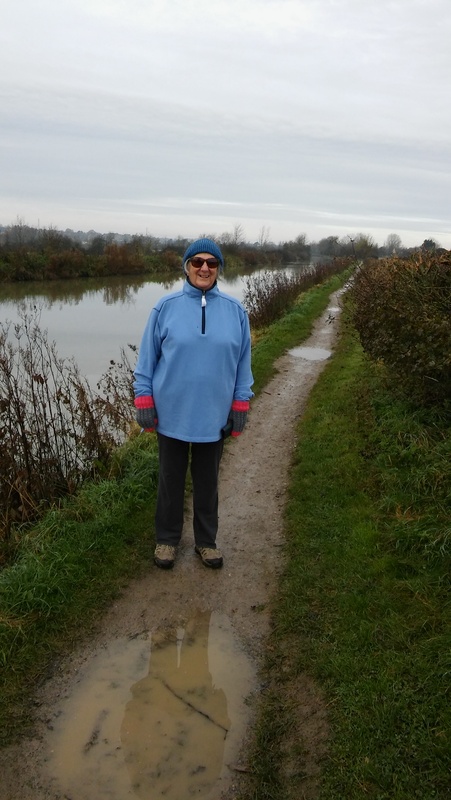 A regular walk of ours is along part of a canal near to our house, we have various routes to and from it but the canal part of the walk remains consistent. Different seasons add to the experience but this time of year is our favourite as less people are using the canal and fewer cyclists. The light is different therefore the views of surrounding countryside seem enhanced. Lots of wildlife thrives alongside the canal and various ducks, moorhens and occasional fish inhabit the area so it is interesting. Occasional hazards occur when a local fishing club hold competitions and block the path but on the whole each group of people (and animals) co-exist. Strange specimen featured! 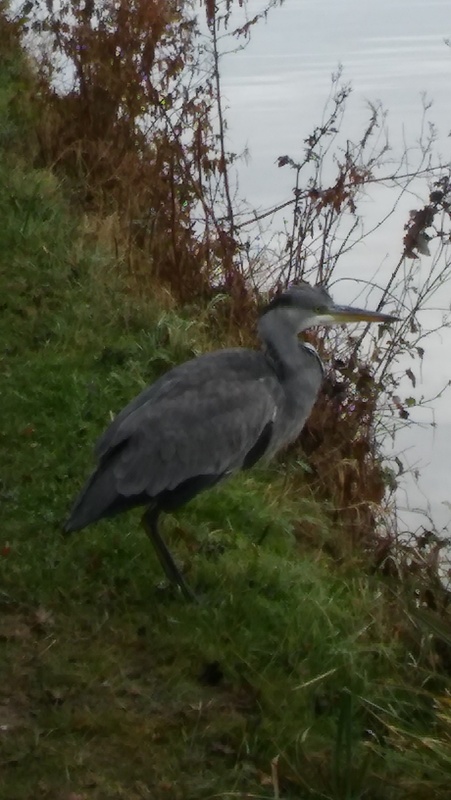 The highlight this weekend was a heron. I wonder if it is the same one that we have seen over the years but is probably an offspring. I keep meaning to find out more about herons as I am fascinated by their inscrutability and patience. This one waited for Peter to approach him, seemed to pose for the photo, glanced around then took flight looking majestic. These birds look so elegant even when flying despite their long legs. 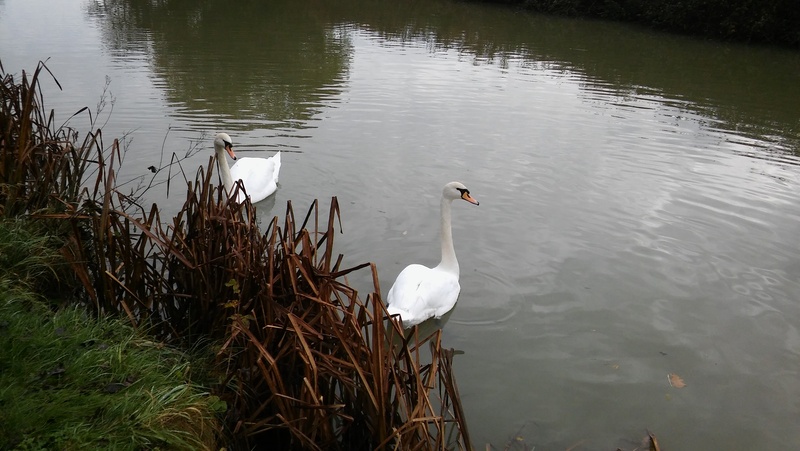 Our next encounter was with a pair of swans who swam right up to the bank, pecked at some reeds, then seemed to pose for the camera before gliding gracefully off. I wondered at first if they thought we had some titbits but they didn’t seem bothered. The two incidents enhanced our walk. I reflect on magical moments like these during the dark grey days. My new experience is Gong Bath or Sound Yoga (Suntatya Yoga). Whilst yoga is one of my main exercise routines of the week this is totally different. Several of my friends have followed my example despite my not talking about my individual experience (unusual!!) as each person’s reaction is different. We assemble in a local hall, normally 8 or 10 of us, with yoga mats, blankets, cushions, comfortable clothing and lie on the floor for an hour with our eyes closed! BUT during this time Helen, a young qualified yoga teacher friend of mine, plays a variety of sounds using singing bowls, gongs, bells, pebbles, rain maker and other instruments but I am unsure of all the names. Occasionally Helen reads a piece of poetry near the end of the session or plays a piece of music. One week around Harvest she played Eva Cassidy’s Fields of Gold which conjured up various images for me. I have given a brief resumé of the sessions as it is impossible to describe. We are in a totally safe environment, in soft light and the effect for me is total relaxation. Apparently the scientific theory is that toxins are released by the sound waves which help release stress, thus helping the body heal and restore itself. I cannot say anything other than during the past year it has made an unbelievable difference to my stress levels. I sleep well the night of the session and the feeling continues for a several days. It is important to drink lots of water to rehydrate thoroughly as the toxins continue to be released. I am unsure of why this works for me and for other people I know, I am pragmatic yet spiritual too so might be susceptible. Two of my friends are deaf and wear hearing aids which they remove for the sessions but they experience similar feelings. Old and New Experiences indeed but invaluable at this stage of my life. Relax is my word of the moment. I hope you NaNo Challenge writers are able to do the same! Good luck for the last week amazing people. Jillian here. Welcome to November. I have been reading about everyone’s travels and wishing I’d been winging away to somewhere fun. Alas, I am working, working, working. I actually have to have another surgery (appreciate some prayers on the 14th) and so I’m trying to work hard to clear my decks before being out for a bit. I am also doing NaNoWriMo- yes, I am crazy. Just lock me up! The bell over the door of the diner tinkled announcing a customer. Tom, the short-order cook, didn’t look up. He was tired of glancing at the door and being disappointed. If only she’d come. Desperate to see her again, he forced himself to focus on the pancakes on the griddle and the sausages in the pan. Keeping everything going at the same time was a challenge when he first came to work at the hole in the wall joint. It wasn’t what he was used to but it was honest work. He couldn’t believe it. It must be his imagination. Was it really her voice? One word—his name—and he recognized it? Afraid to turn around and have his hopes dashed, he ignored the sound and kept his attention on the food orders. There it was again. His broken heart must be working overtime to taunt him. He could swear it was her but she was gone. She’d left him long ago. He’d even moved and gotten a job in a place she’d never think to search for him. It wouldn’t be her if he looked. He was sure of it. Inhaling deeply, he turned to face the person who relentlessly spoke his name. Stunned to see the woman he loved and lost, he couldn’t find words. He stared in amazement. October didn’t work out quite as we had anticipated and carefully planned. We hoped for a five day break in Cornwall, one of my favourite parts on Britain. It was a last minute booking due to work pressures on Peter and timescales on three big projects. I decided on The Cormorant Hotel in Golant, near Fowey (pronounced Foy), right by the river and named after the main seabird that inhabits the area. Luxury boutique-style hotel, seems the trend at moment, but small with friendly staff. 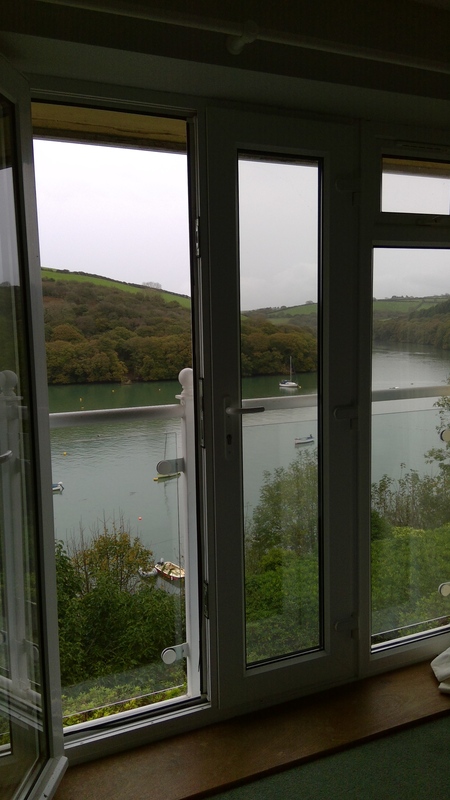 We had a river view room with a Juliet balcony overlooking the garden and wonderful coastline leading down to the sea. The weather had taken a severe turn for the worst and the south west was landfall for Ophelia but early last week she had not arrived. The journey down was beautiful crossing moors including Bodmin Moor famous for Jamaica Inn. Interesting small towns along the route offered coffee and lunch. Finding the hotel was like a treasure hunt despite directions but eventually we arrived and settled in for the night. Pre-dinner drinks offered unexpected entertainment in Anne and Ron from New Zealand. Anne is an international judge of Airedales and the couple were enjoying a break in her judging schedule. They had arrived from Baltimore that day and were due in Yorkshire at the end of the week. We spent an interesting hour listening to hilarious stories of the world of top dog shows including Russia as well as their lives in Australia as breeders and farmers. Time for dinner. 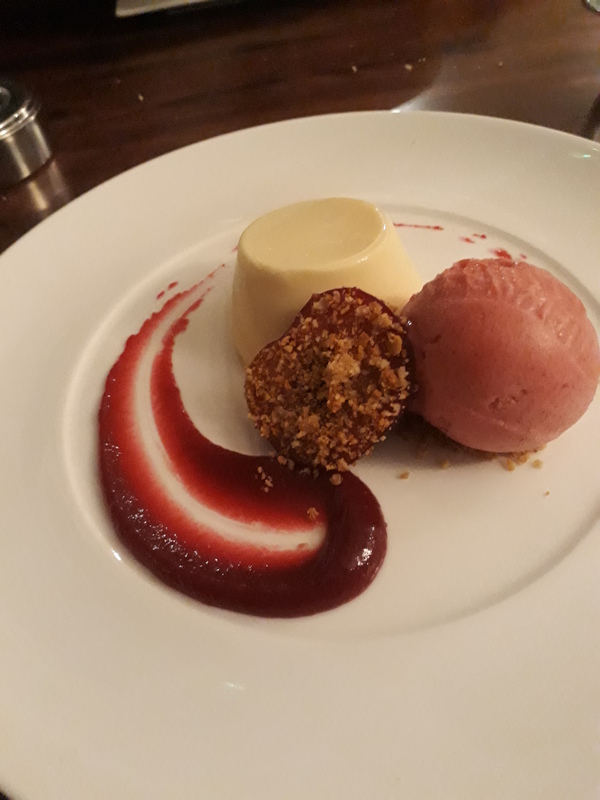 Wonderful menu choices but I opted for local scallops, mixed fish chowder with honey pannacotta for desert, topped off with an excellent bottle of Spanish Rosé. Sorry photo of scallop starter gone wrong! Next day after a breakfast including lots of local produce we set off of Fowey, home of Daphne Du Maurier. Peter was feeling a little unwell but we set off as planned towards Mousehole (pronounced Mowzle) where we had booked a small, fisherman’s cottage. Fowey was well worth another visit as I didn’t make it to the Du Maurier Museum. The weather turned showery so we made our way to Falmouth for lunch and a wander. Next was Penzance, Newlyn then Mousehole as there are great artists galleries as well as home of the Newlyn Artists. We had planned a coastal walk to really visit these the following day so went to find our cottage. 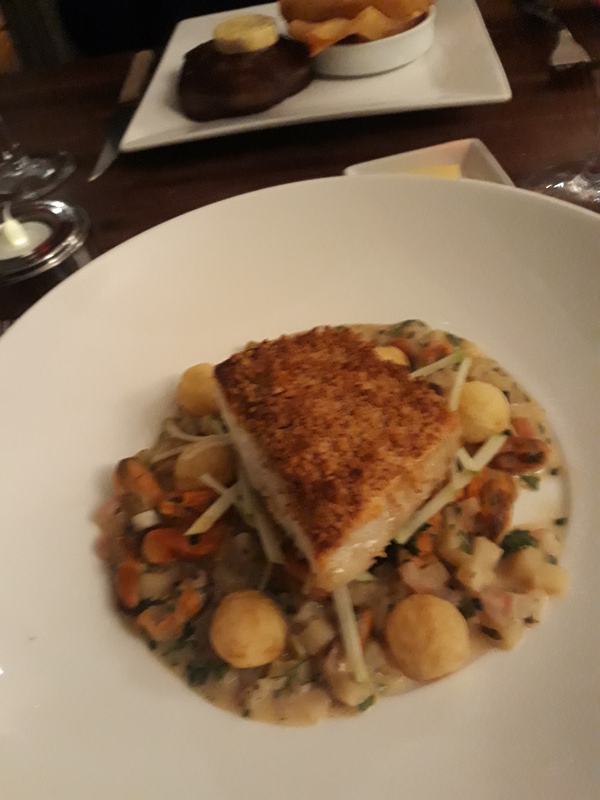 It was better than expected, so comfortable and well equipped with a scrumptious hamper of local food and a good bottle of wine. We planned to light a fire in the hearth following a forage for food from the deli in the village which was highly recommended. I became more concerned over the next few hours about Peter but we continued as planned. During the night Peter developed a high fever and finally told me he had difficulty peeing, was in pain and it was getting worse. He insisted on waiting until morning before trying to see a doctor. Early in the morning I made the decision to take him to Penzance Hospital. We arrived at 9am and he was seen at 9.15am. The staff were wonderful, Peter has “Men’s Problems” as he insists on referring to his symptoms. The doctor fitted a catheter and told us to visit our own doctor when we got home, if we were residents there he would have carried out further tests. We left hospital at 12.15 and I knew Peter wanted to go home although he said no. We packed up and drove home, 6 hours in the storm which had hit with a vengeance. Our own doctor has referred him urgently to the local hospital but his appointment is not for another week.Then the catheter will be removed, testing will begin, diagnosis then treatment. I hope by November we will know what lies ahead. Another added issue has been with our internet, now fixed. We have had to buy a new television, phones and await the next thing! October has been a challenge! !